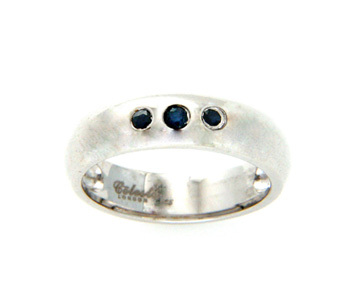 An elegant Blue Sapphire and 925 Sterling Silver 'Trilogy' Ring finished with rhodium polish. The ring is available in size Q1/2. Please contact us if you need any other size. All our Jewellery designs can be customized in any carat and/or colour of Gold or in Platinum and can be made using different Gemstones of different sizes in any ring size. Please contact us at info@celestelondon.com for any enquiry.